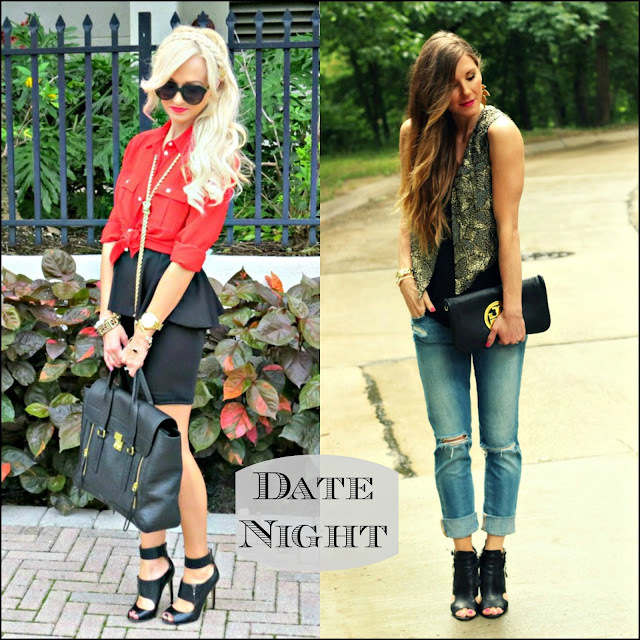 Today I have teamed up with the beautiful Becky from Cella Jane to show you two different looks for a date night or just a night out on the town! I am sure you all know by now that J.Crew's Blythe blouse is one of my favorite tops! I own it like 5 or 6 different colors. It is such a staple piece in my wardrobe. It goes with so much and it is just a classic shirt to have. Here I paired it over a Zara dress and just tied it in the front! I have been wanting a black peplum skirt, but then I remembered I have this dress! I love it when I find another way to wear something in my closet! Check out Becky's blog for all of her outfit details! So over the weekend I went to Nordstrom to shop the last few days of the sale! I had been eyeing these shoes and I was so happy that they still had my size on the last day of the sale! It was meant to be!!! I love them and they are great for Fall! I also have been wanting a new black bag and had been seriously craving this Philip Lim one for a long time! So I got it!! I went back and forth cause it was such a big purchase, but I am so happy I got it! I love it and it will go with everything!! Don't mind my frizzy hair!! I am so over the humidity! Gorgeous look! Love the Blythe blouse - just purchased my first one in black a few weeks ago and I can tell it will be a staple in my closet! I am a big advocate for wearing my pieces more than once. I get so much satisfaction out of making new outfits with pieces I have worn already...like the way you made your dress into a skirt. Love it...and the shoes are amazing! That skirt is amazing, and I am dying over your bag! Love that bag so much Jade, I want the brown one so bad. You look gorgeous as always. Jade, this outfit is amazing! Gorgeous date night look! Love those heels! I see someoneeee toop the plunge on the Philip Lim satchel...jellyyy! lol Love it, you look fab! I have my eye on it, so it may just happen before NYFW. I have been eyeing it for a while and had to get it before NYFW!! Jade, your hair looks perfect (even with the humidity we've got going on in FL)! I love the peplum skirt for a date... so classic but trendy at the same time. Love red & black since they are Georgia colors! I really love the peplum on your skir I can never seem to fine one that doesn't get sad looking after a few washes. Love both of these looks!! That J. Crew top is the perfect staple piece! Love how you styled it with the gold and those amazing heels! Oh these heels are SO gorgeous! I love your whole look. The knotted blouse is the best with this skirt.